I jerked awake at the loud noise. I heard nothing but the steady hum of the air conditioner and the [guest] dog snoring at the foot of our bed. What woke me? It was loud, like a bomb being dropped on the roof, but no follow up noise? Ah, yes, that’s what it was. Except the “bomb” is a tiny mango. 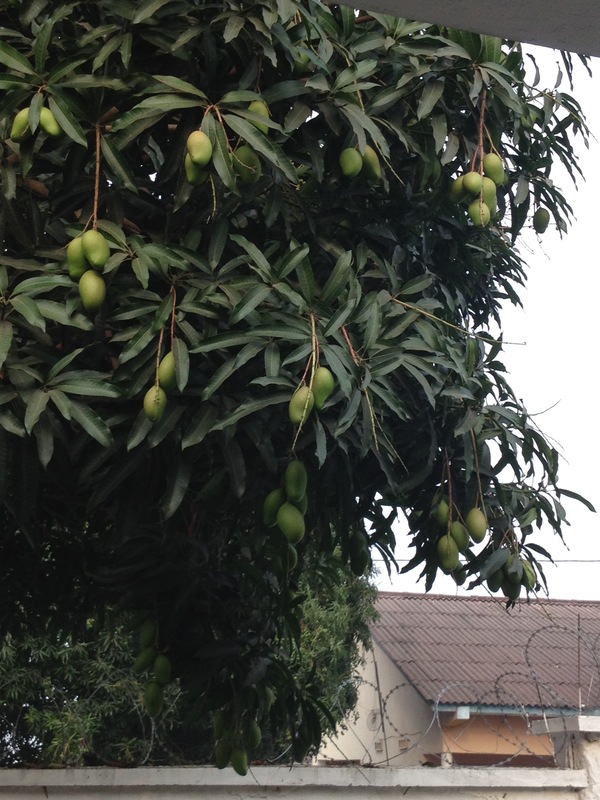 The mangoes are growing and will soon be ripe. Mango season, if you ask me, is actually super annoying. Mango trees are huge and grow waaaaaay too many mangoes. The varieties here tend to be either quite stringy or so mushy that they are called “juice mangoes,” because instead of eating them, you bite the end off and squeeze the juicy flesh out, like nature’s juice box. So we’re not even able to get terribly excited about eating them. They attract the dreaded mango fly as they lie in great quantities, rotting on the ground. And then there’s the fact that they just drop suddenly from as much as thirty feet in the air. And at night, on your metal roof, it’s a startling way to wake up.